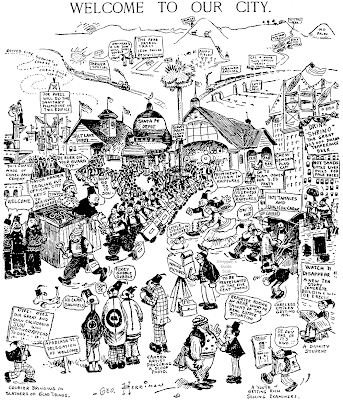 Here we have a pair of impressive crowd scenes that Herriman drew for the big L.A. Shriner convention. They were published on May 6 and 7 1907. 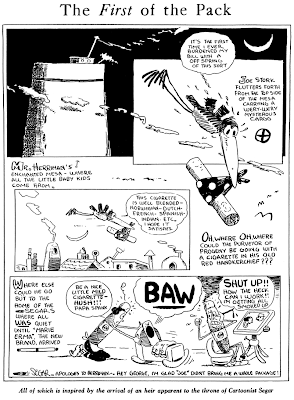 Herriman really pulled out the stops for these cartoons, commenting on tourism, politics, real estate, advertising, you name it! Hello Allan,I love this blog!.Since I was referred to it by a Eddie Fitzgerald post related to Herriman's Art. From Circulation Magazine, September 1922. I've finally had time to start analyzing a little of the material from the Amsterdam News that I scanned in Washington. The first thing I wanted to determine is how my scans compared to the ProQuest digitized version of the newspapers. I'd been told by several correspondents that I should look into using the ProQuest material rather than beating my head against a wall trying to use that terrible PlanOn wand scanner. Now here's the scanned panel cleaned up about as well as I can. If you compare the Proquest version with this retouched scan you can see the obvious difference in quality. 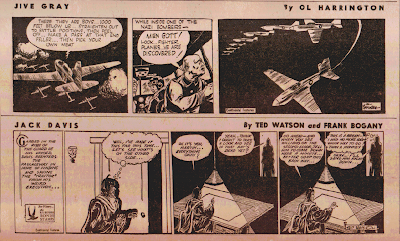 Harrington's lovely grease pencil tone work is reasonably well-preserved, at least by comparison. Since Proquest reduces their images to black and white (no grays at all) they end up with a rather pointillist interpretation of any tone used. The result is very harsh and, I'm sure you'll agree, not a fair representation of Harrington's work at all. Keep in mind, of course, that you're only seeing what I can show you at lo-res screen resolution. When the samples are compared printed from my laser printer at 600 dpi the difference is much more stark. Now here are the same two strips from ProQuest. The difference in quality isn't as pronounced as on the Dark Laughter sample, but even here the scanned version is better. 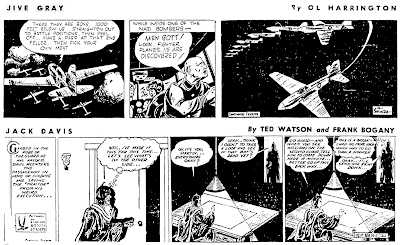 Note the shading on the wings of the plane in the first panel of Jive Gray. In my scan each line is visible, while in the ProQuest version a good portion of it has simply disappeared. Also note that Proquest's version has cut off the bottom edge of the Jack Davis strip. I see this sort of thing happen quite a bit with ProQuest. On the other hand, ProQuest's version has crisper lettering, a result of their extreme high-contrast scanning. Am I any further on making a decision about how to proceed? Well, I'm still unhappy with the scans, but they certainly seem to be a better bet than ProQuest. Are they good enough for book reproduction? My opinion is no, but perhaps I should get off my high horse on the matter and see what a publisher thinks. Nancy Goldstein, if you're reading this, I'd be very interested in hearing your opinion. How are you using ProQuest? When browsing their web site I find nothing hat allows me to use or sign up for the service. ProQuest is a subscription service for libraries. Although you could probably subscribe privately, it would cost you major bucks. I wouldn't be surprised, though, if ProQuest changed their marketing plan somewhere down the road. Ultimately, if they look "good enough" is a matter between you and your editor, but I think they look pretty good. And you avoid the potential copyright silliness of dealing with the ProQuest scans. Keep talking about these technical points, though, please-- there are others of us dealing with the same issues who appreciate any insight. I think you are correct that the cleaned up scans of your microfilm cartoon and comic strip shots are the best. They retain what’s wonderful in Harrington’s drawings, his lush, painterly technique. When I suggested that you shoot the material with a digital camera rather than a scan, I thought you would be working with real paper newspaper; now I see so much of what you were working with is microfilm. For my book on Jackie Ormes, about 106 images were shot from real newspaper; we did need to go to microfilm for maybe 18-20 images. So, here are some tips and ideas in the form of advice from my experience gathering images for the Jackie Ormes book. You probably know a lot of this, so perhaps this is for discussion and for your readers. My task was a little different from yours. 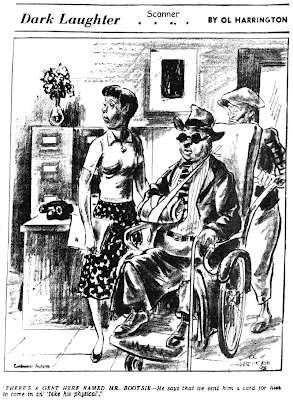 Your example of Harrington’s Dark Laughter b & w single panel cartoon illustrates the difference, by comparing it to Ormes’s Patty-Jo ‘n’ Ginger. Her signature style was crisp black outlines, balanced with lots of white space, and she used Zip-a-tone for shading. This was quite different from Harrington’s dense compositions as you say using grease pencil in Dark Laughter. 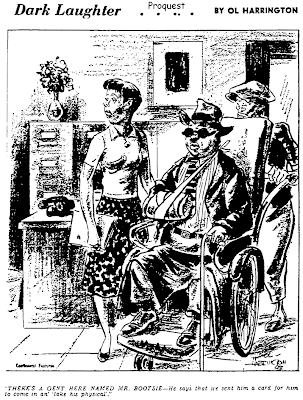 (BTW, didn’t the Pittsburgh Courier funny papers page look great, when these two single panels appeared together in the late 1940s and early 50s, what an interesting visual contrast!) Perhaps your job is more difficult than mine was, Harrington’s compositions are often more complex and nuanced. But maybe some of this will help anyway. Of course it is always best to use real newspaper. It will likely be darkened from age, and there may be printing imperfections (like you can see whatever’s on the page behind) and some of this can be cleaned up – but it is what it is – it’s newspaper with some imperfections and you may choose to leave in some of this. (For color comics, I can’t imagine how you would make a satisfactory image from microfilm.) Persevere in looking for real paper, at least a sample, to be able to compare how the cartoon should look to your microfilm images. This will help you stay with the artist’s conception rather than veering off into just what you like. Use personal contacts to get a newspaper, or at least to get a good scan or photo of real newspaper. 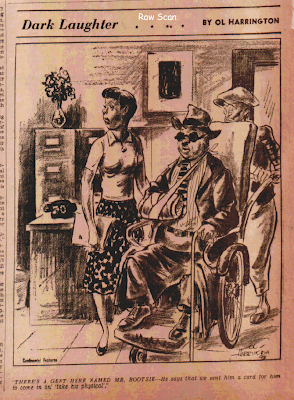 The black press newspaper and cartoons may be hardest to find partly because the circulation was comparatively small. 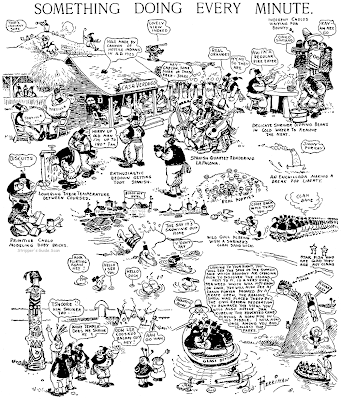 In looking for newspaper--or original drawings--try to find family of the cartoonists. Mid-twentieth century cartoonists and their families sometimes made scrapbooks, for instance, or collected their cartoons and comics in some way. Samuel Milai’s granddaughter recently brought a cache of his work to the Cartoon Research Library at Ohio State University, and it’s presently on exhibit there; Chester Commodore’s stepdaughter donated materials and helped put together a wonderful exhibit on him, and it’s presently at the Vivian Harsh Collection, Carter Woodson Library, Chicago. Let’s hope more of these old papers, slides, and archives can be found and donated. You could also let some eBay and antique dealers know what you’re looking for. 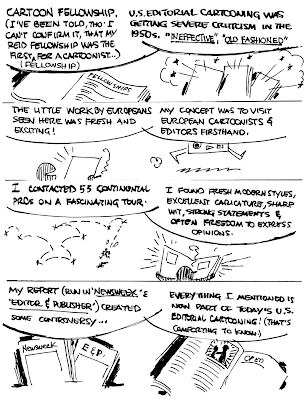 Some cartoon historians and collectors have stuff they might share; check their bibliographies, or pick up the phone and call them. Of course scour through the online databases, and find a friendly librarian or two to spend some time with you, to make sure you’ve seen everything and understand the lingo (“original format” means newspaper). If you find a lead in an out of town/state library, phone them and see if someone at the library or a student can help you in some way. Maybe someone you know lives nearby and can check things out to see if it’s worth a trip. Some libraries’ microfilm is more heavily used than others, becoming scratched; if you can’t get a good scan, try another library. Make your own database with scans or photocopies but keep looking for the best microfilm or original newspaper. Once you find images, whether newspaper or good microfilm, take shots in as many different ways as you can: microfilm scan, microfilm photocopy, real newspaper scan or photo. I got obsessed and even took celluloid slide photos, along with digital photos and scans. For my final image-gathering, I employed a professional photographer who does this kind of work. To shoot the original newspaper, he used a Nikon professional camera and a strobe light for a flash. But some of my consumer camera shots (Olympus C-740 and tripod of course) I took for my database were just as good--though you could make a wall mural from his, and mine maybe as big as 8 X 10. Would you believe, for a couple of the Candy cartoons, we thought the photocopy from microfilm looked best, and we photographed the paper photocopy! The point is, if you have more than one version you can choose the best. Sometimes you have to say, for instance, well the legs look better in that one, but it’s the face that’s most important here, so you have to go with this one. All for now. I loved your descriptions of your experience at the L of C – thanks for all you do! All my scans above were in fact made from real newspapers at the LoC, not microfilm. I can see why you might get confused since the raw scans are so crummy. The problem is with the scanner, not the source material. I still think, though, that using a digital camera is a step in the wrong direction. In my experience camera photos are typically too fuzzy even in good circumstances to make a really sharp final product. Besides, I seriously doubt that the LoC would allow me to bring in a big camera rig.